When it comes to Brazilian filmmaker Jose Mojica Marins or his alter ego as horror icon Coffin Joe, people think of his signature film “At Midnight I’ll Take your Soul.” However, Marins has made other films that are spin-offs of his “Coffin Joe” series, such as 1970’s “Awakening of the Beast.” This film is one of the most unique movies ever and it is quite an underground horror film as well. The best way to think of this film is to imagine “At Midnight I’ll Take Your Soul” mixed with a lot psychedelic elements. Marins basically decided to make a film about the rise of drug culture and its effects on society. The movie’s made up of several little segments where people take drugs and start tripping, leaving the viewer to see their psychedelic and horrifying visions. In between some of these segments professors discuss their theories about drugs as well as what kind of impact Coffin Joe’s persona and films have had on the public and on the human mind. This film is almost unclassifiable. You can call it a horror film, a drug/psychedelic film, or you can call it a Coffin Joe film (not really since Coffin Joe doesn’t technically make an appearance). No matter what you choose though, this film it is still horrific enough that it’s not for everyone, even horror fans. If you want a run of the mill horror film you will not find it here as this is meant to be out of the box and pretty different. If you can overlook its abnormalities, you will love this film. It proves that some of the best horror films out there are extremely unknown and underground. Like with his other projects Jose Mojica Marins writes, directs and acts in this film.This film also serves as an example that Marins or more than a filmmaker but an artist as well. Another interesting aspect of this film is that it’s so impressive and it was done with a tiny budget. As in “This Night I’ll Possess Your Corpse,” “Awakening of the Beast” is filmed mostly in black in white except for the acid trip scene which features vivid Technicolor. On another note if you are new to Coffin Joe do not watch this film because. while “Awakening of the Beast” is an incredible film, anyone new to Coffin Joe should watch “At Midnight I’ll Take Your Soul” and then work their way up. Black metal is a sub-genre of heavy metal that originated through bands like Venom, Celtic Frost, Bathory, Mercy fate and so on in the 80’s. However it wasn’t until the second wave of black metal in the late 80’s to 90’s that that the genre was really defined. The second wave of bands like Mayhem, Darkthrone, Immortal, brought image, grittiness and a DYI approach to the genre that has lasted till this day. 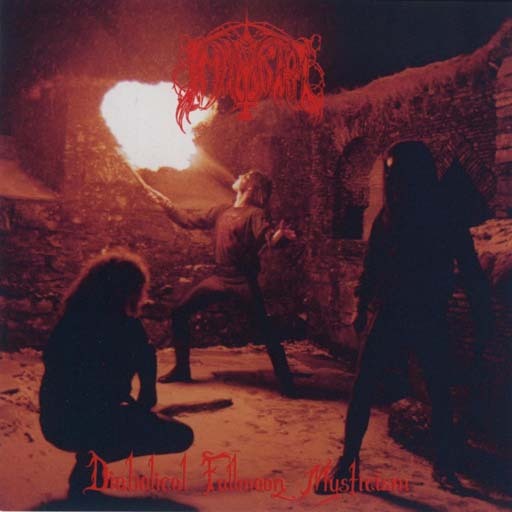 Scandinavian black metal band Immortal released their debut album “Diabolical Fullmoon Mysticism” in 1992, being one of the several black metal bands to use make-up imagery. While other black metal bands have abandoned it, Immortal continues to use it to this day. An interesting aspect of this first album is that Immortal was not just creating music with their instruments and songs, rather they were also making atmosphere. While listening to songs such as “Call of the Wintermoon” or “A Perfect Vision of the Rising Northland” you can just imagine snow covered landscapes and forests that the songs reference. This album has great guitar, vocal, and drum work. Some of the songs have acoustic guitar intros in them as well, adding to the atmosphere, which is a shame since Immortal quit using acoustic intros after this album. If you want a polished hard rock album you will not find it here since “Diabolical Fullmoon Mysticism” is gritty, with a DYI sound and approach. It takes time for the style to grow on you, but if you are new to extreme metal or black metal give this album a listen. It is an essential black metal album. The 1980s saw a hurricane of slasher movies from Friday the 13th to Nightmare on Elm Street as well as many many “one hit wonder” slasher films. A common setting for those 1980s slasher films was the summer camp as in the numerous Friday the 13th movies, Sleepaway Camp, and Madman. One summer camp slasher film worthy of the “Hidden Horror” title is never heard of from normal movie goers and rarely talked about in the horror community because dear old Jason Voorhees gets all the summer camp horror love. That little known summer camp slasher film is THE BURNING. It’s your typical slasher movie plot: A janitor at a summer camp is accidentally burned severely from a prank. Years later, he is released from an institute, and returns to the camp with a pair of hedge clippers to take revenge on a new group of young campers. Though the plot is something we’ve all seen before, what makes The Burning stand out from the rest of the 80s slasher crop is that where in most slasher films the young victims are pretentious unlikable pricks waiting to be slaughtered, The Burning‘s young camper victims are quite likeable and realistic. Hell even the bully is a likeable and realistic character. The film really takes its time with its characters, making you like them more and more as they get into hijinks, play pranks, and tell dirty jokes with each other. It’s practically a Meatballs movie with a young Jason Alexander (Seinfeld), still with a full head of hair! So because we spend so much time liking these wonderful young victims when the killer, Cropsy, does start killing them it’s quite heaving hitting and you feel bad for them. Cropsy is not a typical horror movie slasher who plays nice…or plays by slasher film rules for that matter. Where as a typical slasher will pick off the kids one by one, usually at night, Cropsy practically throws that rule right out the window in what is known as the infamous “Raft Massacre” sequence to lovers of the film. I am sorry but SPOILERS: In the “Raft Massacre” sequence Cropsy kills five, count em, five teens all at the same time in broad daylight with his garden shears in a mean spirited fashion, Tom Savini gore effects flying. How many horror movie slashers can take that title? Not many. Another aspect of the film that shows its intentional ignorance of typical slasher cliches is while usually there is a “Final Girl” who survives the killers attack, here there is actually a “Final Boy” that is stalked and survives at the end. So not only does this wonderful film ignore several slasher cliches by actually having likeable characters, a terrific massacre scene in broad daylight, and a final boy, it also sports a good sense of direction from Director Tony Maylem, good gore effects from Tom Savini, a terrific score from Rick Wakeman that screams “synthesize horror” and a noteworthy and gruesome looking villain. So if you want a summer camp slasher film this Summer but aren’t in the mood for a millionth viewing of Friday the 13th then seek out and give The Burning a watch. It’s hard to not enjoy this well-made slasher film with a terrific rule-breaking villain, gory and mean-spirited death scenes and very likeable characters. When people think of Toho films or Japanese monster films Godzilla instantly comes to mind. However, people seem to forget that Toho has made more then just Godzilla films. 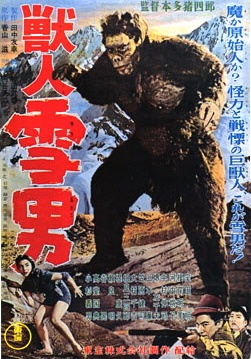 Toho’s produced several other monster films, including the 1955 film Half Human. You could say that this is a cousin film to the Godzilla franchise since it is from Toho, was directed by Ishiro Honda, and featured special effects by Eiji tsubraya. These two were responsible for many of classic kaiju films of the ‘50s and ‘60s, however out of all of Toho’s other monster films, this one is the most overlooked. In 1958 it was released in America in a dubbed and Americanized version, featuring added scenes starring John Carradine. The Japanese version of the film has not been released in America so I will obviously be taking a look at the American version. The film tells the story of an anthropologist (John Carradine) and is presented in a series of flashbacks as he tells a couple of his colleagues about three skiers in the Alps that have an encounter with the Abominable Snowman. The Abominable Snowman has an offspring as well, but one man tries to capture it, accidentally shooting and killing it. The father becomes enraged at the death of his offspring and goes on a rampage, destroying everything in its path. Half Human has some elements that make it similar to King Kong and even Cannibal Holocaust. This film is the epitome of hidden horror. Finding a copy of it on VHS or DVD is extremely difficult. I actually own a copy of it and I can tell you that if you do manage get your hands on it you will not be disappointed. It’s a great movie. The American version of the film is probably all you will be able to find, and unfortunately the American version cuts a lot of the Japanese footage out. The Japanese version can’t be found, but some say that the original unadulterated film exists somewhere out there. This is a hard to find horror and thus a totally underrated film that will probably never have its place in horror cinema history but if you can find it you will not be disappointed. When it comes to legendary heavy metal band Slayer classic albums like “Reign in Blood,” “Hell Awaits,” or “Seasons in the Abyss” come to mind. However people forget that Slayer actually did a cover album, one that is extremely underrated to say the least. In 1996 Slayer recorded “Undisputed Attitude,” a follow up to their 1994 album “Divine Intervention,” deciding to do a cover album. At first they were going to cover Judas Priest and other classic bands, but instead decided to cover punk songs instead. Slayer’s a band that was born of heavy metal and punk and they were one of the first bands to combine the speed of punk music with heavy metal. “Undisputed Attitude” features Slayer covering bands like Minor Threat, D.R.I. and more. They also take the Stooges song “I Want to be Your Dog,” make it heavy, add vulgarity to the lyrics and change the title to “I Want to be Your God” The highlight of the album, however, is the only original Slayer song on the album known as “Gemini.” It is a powerful song that features incredible drum work and musicianship, as well as mood and lyrics that will appeal to any horror movie fan. While not every Slayer album can be a “Reign in Blood” or “Hell Awaits” you can still bet that you are going to get real heavy metal and great musicianship with each of their releases. As long as Slayer is around, you can also bet that heavy metal will be alive. So give “Undisputed Attitude” a shot, it’s a fun listen and entertaining to say the least.